Wikipedia’s mission to “bring knowledge to everyone who seeks it” is obviously aligned with the purpose of museums. For instance, MoMA’s own mission is to help everyone understand and enjoy the art of our time. However, Wikipedia is not universally accepted as a quality resource, particularly in more academic contexts. According to Wikipedia itself, in an article titled Criticism of Wikipedia, major concerns about Wikipedia include its reliability, quality of presentation, and systemic bias — in particular, gender bias and racial bias. One of the biggest barriers for museums in particular is that Wikipedia does not publish original research or consider the expertise of its contributors. Anecdotally, I’ve found that experts in their field who are new to Wikipedia frequently find their first edits reverted because they didn’t understand and follow Wikipedia’s particular rules around “verifiable accuracy”. Instead of deferring to professionally-recognized expertise, Wikipedia values transparency, verifiability, and many eyes: “Every past version of a page is saved, so any mistakes can be easily corrected.” And it mostly works. 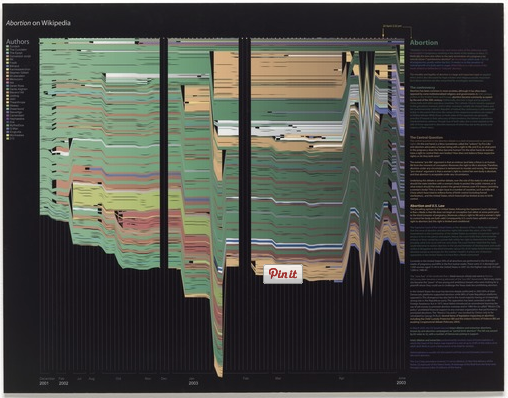 In their visualization of Wikipedia edits, History Flow (2003), artists Fernanda Bertini Viégas and Martin Wattenberg showed that certain types of bad edits to Wikipedia articles are corrected in just minutes. 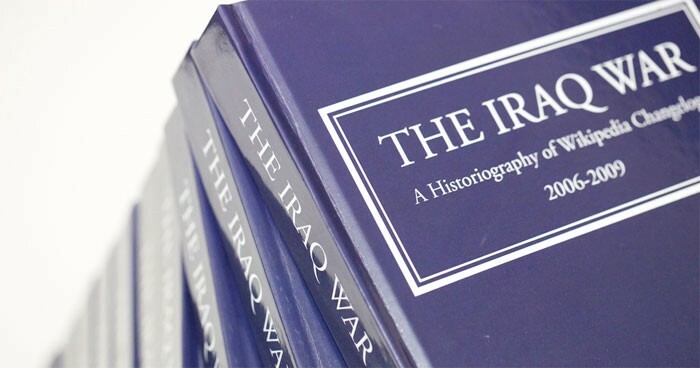 Wikipedia is… not only a resource for collating all human knowledge, but a framework for understanding how that knowledge came to be and to be understood; what was allowed to stand and what was not; what we agree on, and what we cannot… This is historiography. This is what culture actually looks like: a process of argument, of dissenting and accreting opinion, of gradual and not always correct codification. And for the first time in history, we’re building a system that… is capable of recording every single one of those infinitely valuable pieces of information. The Wikipedia community has actively courted galleries, libraries, museums and archives (GLAM). MoMA itself took part in the 2009 wiki scavenger hunt and photography contest Wikipedia Loves Art. Richer collaborations followed in 2010, with the Brooklyn Museum using Wikipedia pages as extended labels within the Seductive Subversion exhibition (WikiPop) and the British Museum hosting the first “Wikipedian in residence”. The redesigned collection websites of the Walker Art Center and Cooper Hewitt Design Museum, launched in 2011 and 2013 respectively, include excerpted Wikipedia content. Wikipedia’s multilingual, collaboratively-edited encyclopedia is one of the top-10 most visited websites in the world. The English version alone contains almost 5 million articles and benefits from the edits of more than 100,000 contributors each month. By contrast, MoMA is a top 25,000 site globally (top 10,000 in the US). If MoMA wants people to understand and enjoy the art of our time — as our mission says we do — then we should contribute to Wikipedia, which is, for most people, the content website of first resort. Many of the people learning about art on Wikipedia use it as a starting point, not the start and end of their enquiry. We know this because Wikipedia is already a major referrer of traffic to moma.org, alongside Google and Facebook. When MoMA released its collection data into the public domain, Wikipedians made Wikidata properties P2174 and P2014, creating links from Wikipedia to more than 3,500 artists and 2,ooo artworks. MoMA has embarked on a sustained and critical engagement with Wikipedia: proactively sharing MoMA information on Wikipedia; excerpting Wikipedia on our collection website, with an invitation to “view or edit”; and hosting regular edit-a-thons targeting underrepresented artists. MoMA’s web analytics show that artists are the entry point to our collection. Of the top 500 search terms on moma.org in 2014, 62% are artist names. (Just 8% are art terms and 6% are specific artworks.) People come to art through artists. And yet most of MoMA’s content development has been centered around the object, not the artist. Before the recent redesign of our collection website, most of our 10,000 artist pages simply included the artist’s name, brief bio (“Australian, born 1973”), and a list of the artist’s work in the collection. In 2013, MoMA’s interpretation and research team conducted an audit of Wikipedia entries for a sample of artists in MoMA’s collection. This audit found that Wikipedia offered a good representation of MoMA’s collection artists. Wikipedia covered the full range of mediums of interest to MoMA, including design and film, with more entries on contemporary and emerging artists than art historical resources such as Grove Art Online. The individual entries were also more up-to-date. For example, the Wikipedia entry on Marina Abramović included extensive information on the 2010 MoMA exhibition The Artist is Present, which the Grove entry, written before the retrospective, lacked. Finally, the tone and content of Wikipedia articles were thought to be accessible and relevant to a general audience, with citations leading to further resources. Knowing that our artist pages were an important entry point to the collection website, and having established that Wikipedia provided “good enough” entries for thousands of those artists, we decided to dynamically excerpt the lead paragraph of relevant Wikipedia articles. In this way, the information on MoMA’s artists pages will be continuously updated. The introductory sections in particular are monitored for accuracy and appropriateness by dedicated Wikipedia staff and volunteers. Wikipedia represents the best intentions of the web but it sometimes falls short. We can all contribute to making it better. MoMA hosts regular edit-a-thons targeting underrepresented artists. The edit-a-thons started organically but have become an important foundation of our sustained and critical engagement with Wikipedia. In October 2011, MoMA hosted its first edit-a-thon in support of Paola Antonelli’s design exhibition Talk to Me. After a tour of the exhibition, the 30 edit-a-thon participants — including experienced Wikipedians and students from NYU and Staten Island CUNY — broke into groups and worked on editing and writing new Wikipedia articles related to artists and objects from Talk to Me. Improvements included links back to MoMA’s online resources. More recently, in March 2015, MoMA and POWarts collaborated with Art+Feminism on an edit-a-thon addressing the representation of women artists, feminism, gender studies and LGBTQ issues. As of 2013, only 13% of Wikipedia contributors were women and there is ongoing controversy about the treatment of women contributors in the “Wikipedia boys club”. 73% of respondents said they had never edited a Wikipedia article before, and 76% attended one of the training sessions offered at MoMA during the event. 35% expressed how much it meant for them to participate in a communal event dedicated to making a difference. 52% of survey respondents stayed for several hours, and 100% said they would be interested in participating in future edit-a-thons. Since then, MoMA has worked with Wikimedia on hosting almost monthly edit-a-thons that address the intersection between art and what Wikimedia terms “missing pieces” — constituents that are underrepresented on Wikipedia. Edit-a-thons this year have included Wiki Loves Pride, The Black Lunch Table (BLT), WikiAPA Asia Pacific Americans, Arte y Cultura Latinoamericana Latin American Art, and Basquiat Still Fly @55. See also: Museums Open Up to Power of Wiki, by Robin Cembalest in The Wall Street Journal. Reserve your place at the next Art+Feminism Edit-a-thon on Saturday March 5, 2016. We will provide tutorials for beginner Wikipedians, reference materials, childcare, and refreshments.